United Airlines has brought back the stroopwafel as an on board snack after a swap to maple wafers in June sparked customer uproar. 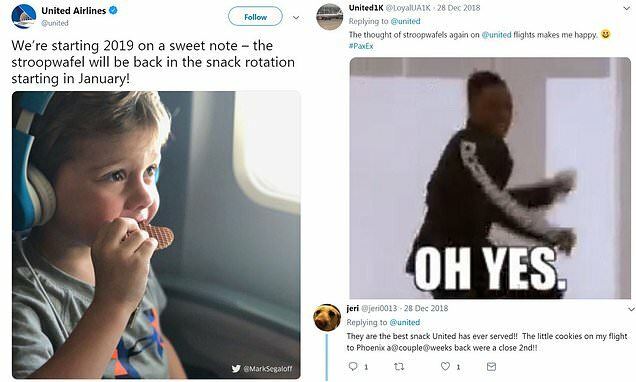 Travelers reacted with joy after the carrier announced the sweet treat would be making a comeback 'in the snack rotation starting in January'. Another said they were their 'favorite reason for taking a morning flight' while one called them the 'best snack' ever served by the airline. One woman even said she served them at her wedding. In June customers reacted with fury to the news United would be cutting stroopwafels from its on-board food offering on certain flights. One tweeted 'shame on you' at the carrier and another said 'you can lose my suitcases but don't take my stroopwafel'. The Dutch treat was introduced on United flights in February 2016.